Simple, sweet and oh so neat! We needed to make our little coffee situation both functional and eye appealing. 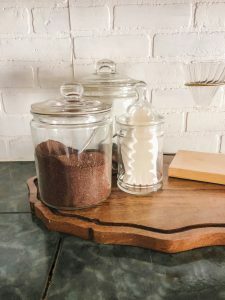 So I went for my favorite glass canisters to keep our coffee area tidy! Aaron and I like different flavors of coffee so one jar (the biggest) is for his coffee and the other is mine. For months we’ve been keeping the Folger’s containers under the counter. Having thear glass canisters enables us to keep our coffee nearby yet look cute! Ha, these containers also serve as decor because they look cute! The older I become the more I look for decor to serve or be able to serve a functional use. That’s exactly what these glass jars do! Ha, I just had to write about these little jars because they make me happy every morning. Thanks so much for reading my post today! P.s. to see where I get my favorite glass jars click HERE.